Hotel Belleclaire has a complimentary Media Lounge with gaming and computers for guest use. This suite at the New Yorker has a pullout sofabed and privacy wall. If your hotel doesn't serve breakfast, you'll find lots of alternatives for a cheap meal. 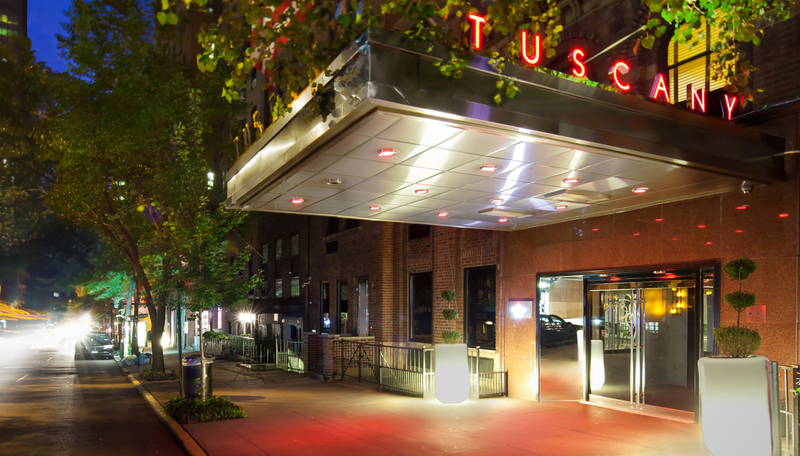 The Tuscany Hotel is on a quiet Murray Hill side street, and very stylish inside. 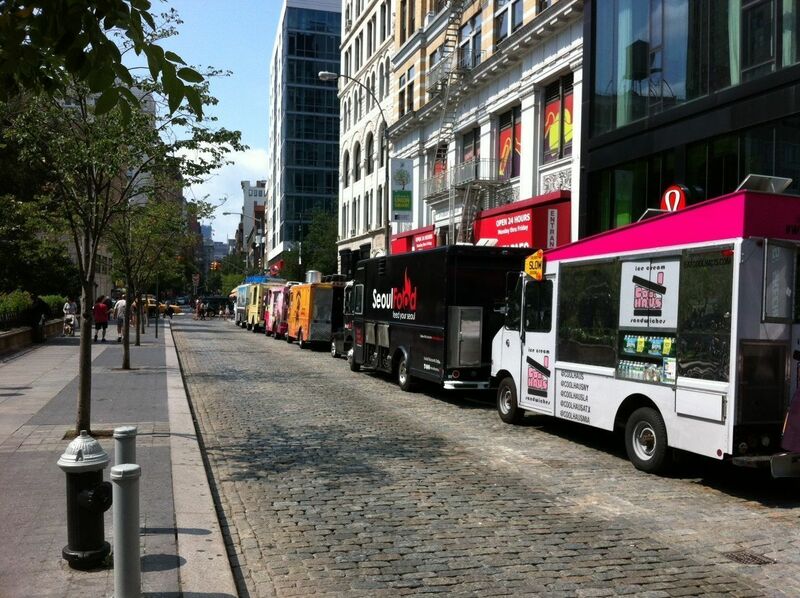 One of the joys of visiting New York is its cheerfully chaotic blend of the old and the new. Cutting-edge architecture sits cheek by jowl next to historic properties, many of which have been repurposed into restaurants and hotels. And while shiny new hotels have their appeal, we thought it would be interesting to descend on a handful of historic properties to see how they fared with families. The verdict on all three was a resounding thumbs up for location, comfort and price. The 240-room Hotel Belleclaire, located on Manhattan’s upper West Side, is one of six boutique hotels under the Triumph brand, and while not super tall by today’s standards, it was once considered one of the city’s tallest skyscrapers. The hotel has wisely retained its Art Nouveau style while updating the guestrooms and suites with all of the comforts of home. We stayed in a Parlor Suite, which was perfect for our family of three. The suite came with a king bedded room with an en-suite bathroom and a separate living room with a pull-out couch. The rooms weren’t large, but every inch was used well, and the enormous windows looking out at the city gave a sense of a larger space. We especially liked the children’s amenities in the room when we arrived, like a kids’ robe and slippers and a little lunchbox with child-friendly goodies. Other features that work for families include free Wi-Fi, flat-screen HD TVs, a media lounge with arcade games and Macs, and a fitness center where we could shake off the rigors of travel. Current Package: The hotel offers all sorts of packages, including a City Sights Family Photo Package that includes a one-hour family photo session with Photo Op NYC at Belvedere Castle or another New York City location of your choice, an in-room movie rental, a $75 Shake Shack gift card (it’s a block away across from the American Museum of Natural History), and daily continental breakfast for four at the Coffee Bean & Tea Leaf. The special also includes a late, 2 p.m. check-out to help sleepy heads get a good start the next day. The package, which is good through Thanksgiving, starts at $549 per night. The Tuscany is a St Giles Boutique Hotel, located in a quiet, residential Murray Hill section of Midtown. Quiet doesn’t mean boring, however, as we soon discovered the minute we walked into the diminutive lobby, decorated with eye-popping Fortuny light fixtures and hipster furniture. This is a hotel that does a great job of blending the old and the new. The 14-floor, 124-room property was built in in 1928 and has the distinction of being the first in Manhattan to boast color TVs in the guestrooms. Its new look is thanks to a multimillion dollar renovation that culminated in its reopening in 2012 with studios, lofts and loft suites featuring a contemporary décor and generously sized bathrooms. We appreciated that all rooms also include state-of-the-art multifunction docking stations for iPhones and iPads, flat-screen 46-inch TVs and free Wi-Fi. Although we didn’t stay in the newly decorated 17th-floor Penthouse, we have it on our bucket list, thanks to its massive fireplace, full gourmet kitchen and 1,200 square-foot wrap-around terrace with stunning views of the Chrysler and Empire State buildings. Hotel amenities also include a 24-hour fitness center and dining at Audrey Café & Bar. Current Package: Because we usually arrive in New York by car, we loved the Park and Play package, which includes overnight valet parking for one car and continental breakfast in Audrey Café. The Park n Play rates range from $299 to $585 per room, per night through 2014. A Suite Steal Deal offers a 25% discount on a third night with a booking of three or more consecutive nights. Who hasn’t heard of the New Yorker Hotel, that historic structure in Midtown, across the street from Penn Station and Madison Square Garden? Now the Wyndham New Yorker Hotel, the 1,083-room Art Deco property has been there since 1929, but the good news is that it is already reaping the benefits of a massive, five-year, multimillion dollar renovation. There is nothing dated about the redesigned guestrooms -– we had two double beds, which worked for the three of us -– and the busy lobby and eateries encapsulate the spirit of bustling Manhattan. The hotel can also accommodate families with young children by offering warm cookies and milk at turndown after a long day of sightseeing, and we appreciated the free Wi-Fi and the 24-hour access to the fitness center. Although the property is big and meetings form a big part of their business, the hotel is also a haven for leisure travelers who want to be right in the middle of the action. The concierge team is on hand to obtain Broadway tickets and offer suggestions for cool, family-friendly activities, and had we had Fido along, he would have been welcome, as well. Probably the most iconic feature is the Tick Tock Diner, which serves up homestyle comfort food, but with the kind of updates today’s kids enjoy, like sweet potato fries and nachos with chorizo and quacamole. You can also try the club-like Cooper’s Tavern or spring for breakfast at the Sky Lounge, open to guests in the Tower Rooms and Suites and Plaza Suites. Current Package: Families can take advantage of an Empire Package, good through December 29, 2014, that includes accommodations, two passes to the Empire State Building Observation Deck and continental breakfast in the Sky Lounge. The package is priced from $179 per room, per night, double.